Also, an Obliterator is here. He was the third one I picked up a while back, and the other two were among my first painted metal models. Technically, they’re a kind of pink. They’re people-pink. I really don’t care for how most pink horrors look, and (as I just mentioned) I innately resist being told what or how to paint. However, since it’s right there in the name, I felt I should abide by at least the periphery of the concept. Given how long I resisted even getting pink horrors, I figure having some assembled gives me the freedom to paint them up however I like. 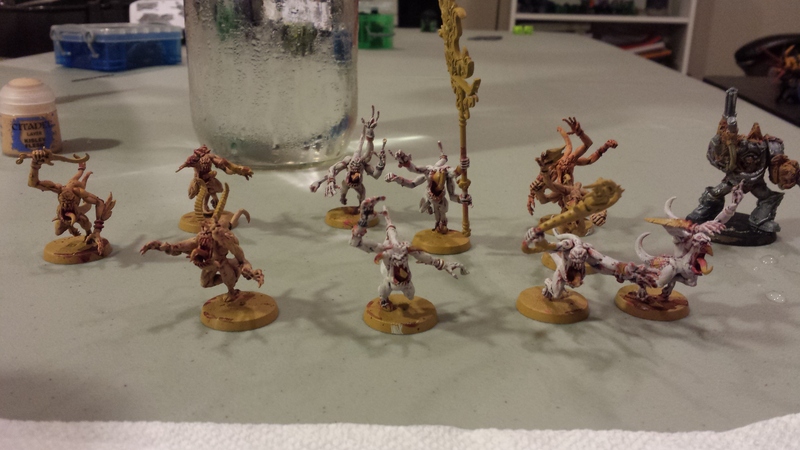 I experimented with a few different flesh tones; I think it was Kislev-, Ungor-, and Pallid Wych Flesh. Of the three I definitely like Pallid Wych the best, so moving forward I’ll prioritize them more highly. It gives a sort of tribal war-paint look to the creatures, which leads me to depict them as the fears and doubts of shamans on some backwater planet given form and gone mad. I also magnetized the icon and instrument, more for ease of transportation (assuming my foam ever comes in; I’ve had some on order for 4, maybe 6 months?) than any plan for swapping them out. In the event I do need to swap them out, of course, it’ll be very quick to paint up an extra pair of arms–I may have done so already, actually, as I’ve not put them to use outside of the house. Realistically there’s no great benefit to running them with the icon or instrument most of the time; the icon does grant some free hits, which is hot, but I still don’t like the Warpflame rule so I honestly don’t shoot with them all that often when they’re on the table. However, since they’re all but guaranteed to be summoned to the table, they come in with both upgrades anyway, so I went with them as the default. Eventually I’d like to get another 2 boxes, so I can start building lists that run 30 Pinks in two groups of 15. That feels like the sweet spot to me; gives me 4 Warp Charge for 300 points, has some resilience to shooting and relatively excellent resilience to Perils, and would hopefully have weight of numbers enough to punish small assault squads who drop in and cut them to bits. I think that, armor-wise, I’ll go with something lapis lazuli-esque on a bright silver. That’ll look good on the whitemost daemons, and that’s what I’m pitching towards in my aesthetics. Not sure about the upgrade items though; they’re huge and neat, but I’m so unenthused about the unit/models in general that not much has bubbled up. Incredible faces and musculature, though. I’d love a larger model cast this way, without the damn beaks (really don’t love the beaks, wouldn’t have used them if I had more heads to work with). Tzeentch is always a caster fella, but if they gave me a melee daemon, some amorphous mass of chanting faces drooling fire while huge fists crush infantry, I’d be into that. Or, having typed that out, maybe I throw a box of the fellows at that beautiful dream. 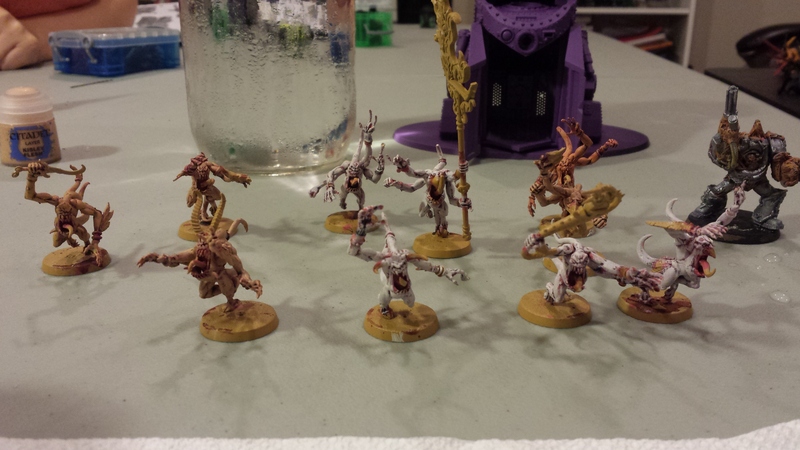 Posted in Painting, Warhammer.Tagged Chaos, Painting, Warhammer, Warhammer 40k.